Airline CEOs sign the Club's guest book and their photos before a May 15, 2015 luncheon. Left to right: W. Douglas Parker, chairman and CEO of American Airlines Group; Jeff Smisek, chairman, president, and chief executive of United Airlines; Richard Anderson, chief executive of Delta Airlines. Club President John Hughes presides. 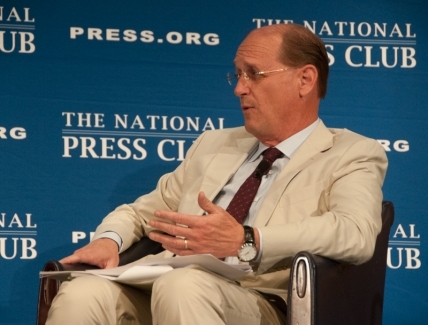 Richard Anderson, Delta Airlines CEO takes part in a a Q&A session at a National Press Club luncheon, May 15, 2015. 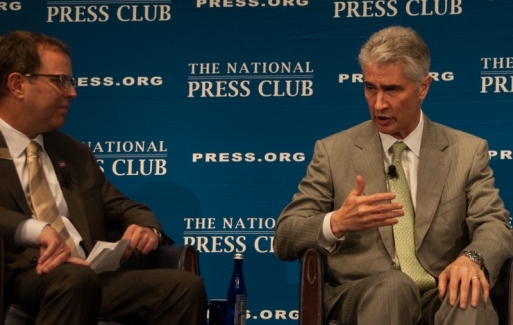 United Airlines CEO Jeff Smisek answers a question posed by Club President John Hughes at a May 15, 2015 luncheon. 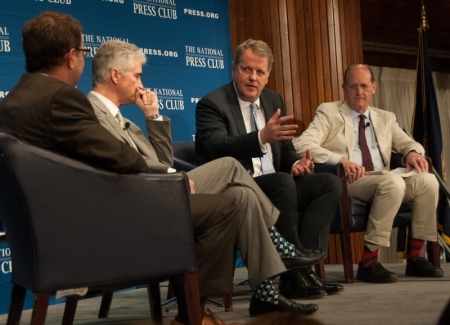 Douglas Parker, American Airlines CEO makes a point in a luncheon discussion at the Club, May 15, 2015. Club President John Hughes, United Airlines CEO Jeff Smisek (left), and Richard Anderson, Delta Airlines CEO, listen. 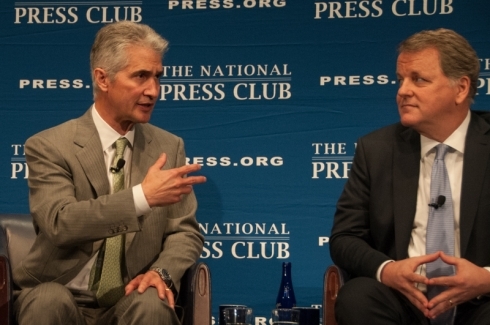 United Airlines CEO Jeff Smisek (L) and Douglas Parker, CEO of American Airlines listen to an audience question read by Club President John Hughes at a May 15, 2015 luncheon. Richard Anderson, CEO of Delta Airlines, answers a question from the audience as Douglas Parker, CEO of American Airlines, listens. 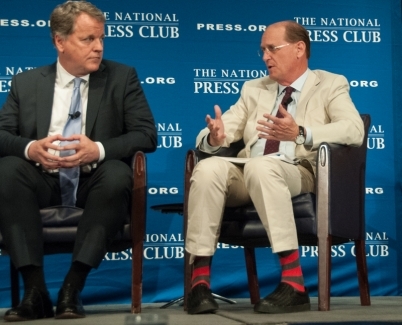 Anderson and Parker appeared at a National Press Club luncheon, May 15, 2015. National Press Club President John Hughes hands a souvenir coffee mug to United Airlines CEO Jeff Smisek, who passes another to Douglas Parker, CEO of American Airlines following their appearance at an NPC luncheon, May 15, 2015. 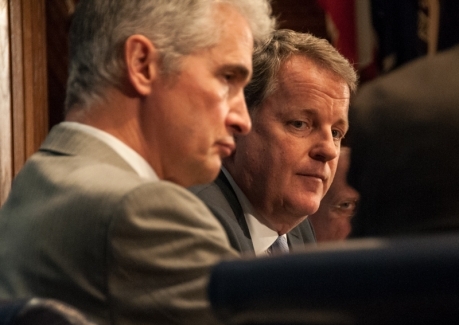 American Airlines CEO Douglas Parker listens Jeff Smisek, CEO of United Airlines as he responds to a question at a May 15, 2015 luncheon.